Authors: Magda Guglielmo, Richard R Lane, Blair C Conn, Anna Y Q Ho, Rodrigo A Ibata and Geraint F Lewis. 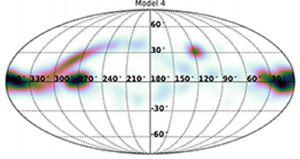 Figure 1: A map of stars in the outer regions of the Milky Way created using SDSS images of the northern sky. Several stellar streams have been highlighted, including the Monoceros ring and the impressive Sagittarius stream. In this figure, colour is indicative of stellar distance, whereas the intensity indicates the density of stars on the sky. White circles highlight some galaxies discovered by the SDSSImage credit: V. Belokurov and the SDSS. Back in 2002, an apparent overdensity of stars was uncovered by the Sloan Digital Sky Survey (SDSS). This so-called Monoceros ring is a long filament of stars which has wrapped itself around the Milky Way several times. In the first bite of the year, we look at the simulations undertaken by astronomers to explore one of many scenarios proposed to explain its much disputed origin. The Milky Way, like many other galaxies in the universe, is surrounded by several streams of stars. For example, the impressive Sagittarius stream, shown in Figure 1, is composed of stars it stole from the Sagittarius dwarf elliptical galaxy during its merger with the Milky Way. From its shared stellar properties to the dwarf galaxy and the stream’s structure, astronomers were able to deduce its origin. Disrupting satellite scenario Like the Sagittarius stream, it is likely that the Monoceros ring is the result of a merger, with the remains of a dwarf galaxy located in the Canis Major region. Just part of the Milky Way The number of stars observed drops off rapidly ~ 50,000 light-years from the centre of the Galaxy, but reappear again at 60,000 light-years. This could be explained by our galaxy being rippled, not flat. But both theories have problems. The Canis Major region lacks the expected overdensity of periodic RR Lyrae stars, associated with dwarf galaxies, and we have never observed any galactic ripples beyond this first ring. Today’s authors focus on the first scenario and whether we can use simulations to better determine the mass and location of the proposed disruptive satellite. 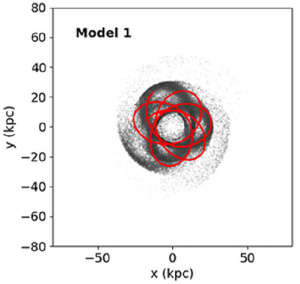 Implementing N-body simulations for several masses, the authors investigated what happens to the simulated dwarf galaxy when thrown at the Milky Way from various locations over a 3 Gyr (where 1 Gyr = 1,000,000,000 years) evolution period. The results were then compared to present-day observations from the Panoramic Survey Telescope and Rapid Response System (Pan-STARRS) based in Hawaii. Figure 3: The trajectory (red line) of the simulated dwarf galaxy for the first model (mass = 3 x 107 solar masses). The current location for particles left behind by the merger are shown in grey. A segment of Figure 1 of the paper. The resulting trajectory, the red line in Figure 3, for a dwarf galaxy of 3 x 107 solar masses is shown above. Sadly the interacting dwarf galaxy is destroyed for model 1, but survives in higher mass models 2 – 4. Figure 4: Top = Simulated stream of particles located 40 degrees above and below the galactic plane for model 1. The stream tracks are in blue, where the solid line is all particles, dashed represents particles in the northern region and the dash-dotted line is southern. A segment of Figure 1 of the paper. Observations of the Monoceros ring show the southern region to be more dense than the northern region; an observation which is also visible in Figure 4, where the black particles are more concentrated in the south than north. However this agreement with observations is only present for model 1. Figure 5: The likely present-day location of the dwarf galaxy as determined by model 4, where the mass of the dwarf galaxy is 6 x 109 solar masses. The most likely location of the dwarf galaxy, in accordance with models 2-4, is galactic coordinates (l = x axis,b = y axis) = (15,0). Darker regions highlight the most probable location of the dwarf galaxy. The simulations also provided the authors with many possible locations for the dwarf galaxy, therefore all of the results for each model (for different starting locations, velocities etc.) were combined to form the map like the one shown in Figure 5. Darker regions on the map correspond to regions where the dwarf galaxy is more likely to be. When comparing the different models, aside from model 1 where the dwarf galaxy is destroyed, it is clear that the most likely place in common is located at the galactic coordinates (15,0). Unluckily (or conveniently) for the astronomers, this places the dwarf galaxy in a very tricky place to observe – behind the galactic bulge. As previously mentioned, the origin of the Monoceros ring is under debate and there are still problems with the current simulations. Too heavy In order to recreate the southern region being denser than the north requires the initial mass of the dwarf galaxy to be an order of magnitude higher than current estimates for the ring. Rotating with or against? Unlike previous simulations, the authors cannot find a clear preference for prograde (rotating in the same direction as the galaxy) or retrograde (the opposite) motion. Both motions produce simulations which agree well with observations. To this effect, the authors have undertaken similar simulations to explore the other likely explanation for the Monoceros Ring – ripples in the galactic plane! Such results will prove for an exciting comparison in the future, and may explain why we have not observed more ripples. So although we are moving in the right direction, we are no closer to confidently determining the origin of this unusual, ring-like structure. Happy new year! 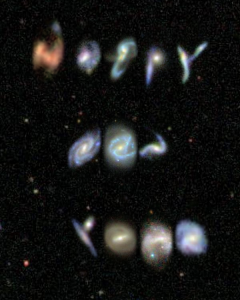 This message was created using galaxies from the SDSS. Image credit: Steven Bamford, SDSS, and the Galaxy Zoo Project. If you’ve made it to the end of this astrobite on the first day of the year, after a night of celebrations, then some serious kudos are in order. On behalf of the entire Astrobites collaboration, I’d like to wish each and every one of you a very happy new year! Here’s to hoping for a year full of successful science, exciting experiments and dazzling discoveries.